Sick of my daughter asking me to unsnarl her tangle of necklaces, I decided to build her a necklace tree. After some thought, I figured the tree would be a bad idea because it would be just one more thing to clutter up the horizontal space in her room. So I changed my mind and made her a necklace holder that hangs on the wall. With my daughter obsessed with the color pink, I’ve been looking for woods or ways to treat wood that finish with a pink or red hue. For this project I found a nice wide piece of 1/2″ thick padauk that was pretty flat. Once I had the piece of wood, I found a heart shape online and scaled it up to use the entire board. 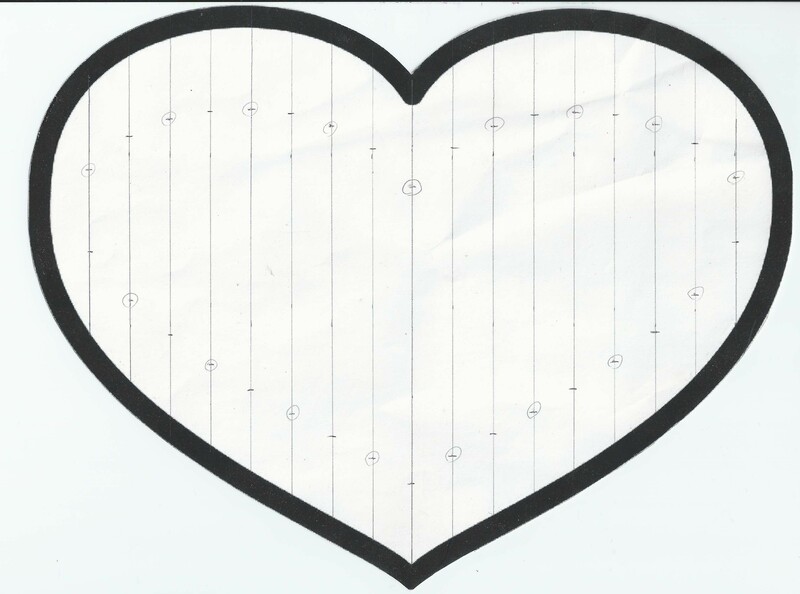 I printed out the Heart Pattern and glued it to the board with spray adhesive. Then I cut out the shape with the scroll saw and sanded down to the line with my oscillating sander. I put an ogee bit in my router table and carefully routed a profile around the edge of the heart. Next I had to figure out where to place the holes. I experimented with different necklaces — seeing how close they could be hung together without overlapping — and found that I should space the holes half an inch apart. So I drew lines half an inch apart starting from the center line on another copy of the pattern. Then I made marks 1″ in from the black line to locate the position of the holes. Since I didn’t want necklaces overlapping, I circled every other mark to locate the holes and transferred the hole locations from the pattern to the wood. If I would make another necklace holder, I would transfer the hole locations before I cut out the heart shape, because I wasn’t able to properly align the pattern again. If you look at the top picture you can see the bottom two hooks aren’t centered perfectly. Finishing the project was another challenge, I started out using the same wipe on urethane I’ve been using for the last two projects. After the second coat I noticed some gummy areas of finish that just wouldn’t dry, even after several days. So I used some mineral spirits to clean off the sticky parts and recoated the urethane — the gummy spots came back. So I ended up sanding off the finish with my orbital sander — taking off some planer marks I missed the first time. This time when I coated the project the finish dried correctly. I’ve had this problem before with wipe on urethane, I’m not sure what causes it. Once the final coat of urethane was dry I applied two coats of paste wax to really shine up the wood, screwed in all the hooks, and nailed the brass hanger into the back.